A serene river cruise is the perfect way to start this journey exploring the laid-back nation of Laos, with its stunning temples, ancient relics and a quiet capital city that allows you to journey to a bygone era. Arrive in the city of Chiang Rai in the north of Thailand, where you will be taken by private transfer to your hotel. The remainder of the day is yours to spend at leisure. After an early start from your hotel, you’ll cross the border to Laos, known as the 'Land of a Million Elephants' to join the two-day long river cruise to Luang Prabang. The first day onboard takes you as far as the small town of Pakbeng, with your time on the water being spent taking in the beauty of your surroundings on the mighty Mekong River, with its dense jungle and stunning gorges. Depending on the current, you may arrive in Pakbeng in time to watch the sun set from the balcony of your accommodation. Following an optional visit to the local market for the early risers, the cruise deeper into Laos continues with breaks in the small village of Ban Baw and at the Pak Ou Caves; two caves carved from limestone cliffs which are home to thousands of Buddha statues. 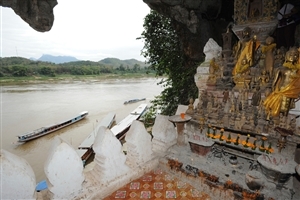 Your cruise will end in Luang Prabang before sunset for transfer to your hotel. Early risers can see the special sight of local monks collecting offerings from residents of the town before a day of exploration, which starts with a visit to the National Museum to discover the story of the country. Learn about Buddhist beliefs at the Wat Mai temple, pay a visit to the Traditional Arts & Ethnology Centre to explore Laos’ diversity and then spend time with the local people before learning how to cook Lao style at the Tamarind Cooking School. A short transfer through rice field and hills – which includes a stop at a small village to meet the locals – will take you to the stunning waterfall at Kuang Si. Once here, you can elect to relax and enjoy the surroundings, take a dip in one of the many beautiful turquoise pools or walk to the top of the falls to admire the scenery below. There is also time to visit the nearby sanctuary that is home to a number of Asiatic Black Bears, all of which were saved from poachers, before returning to Luang Prabang for time at leisure. Enjoy more free time during the morning before being transferred to the airport for the flight to Vientiane, where more time at leisure awaits. 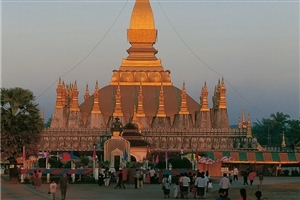 Take a stroll along the banks of the Mekong River, pay a visit to the local markets or simply relax in your hotel. Enjoy a guided tour of the Lao capital, including the serene WatSisaket temple and That Luang; regarded as the holiest site in the whole country. The history of the conflict in neighbouring Vietnam and the impact on the Lao people will be told on a visit to COPE, a group who works to aid landmine victims before the day ends with a visit to the local home to witness a tradition Baci ceremony, which is used to celebrate special occasions and important events. Following breakfast, transfer to the airport for your journey home. Domestic flight from LuangPrabang to Vientiane with Lao Airlines. 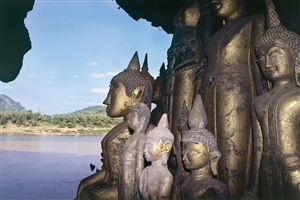 English speaking local guide (1 per place and no Exotissimo guide on the Luang Say Cruise).